VBS = LOTS. OF. FUN!!!! Wow! Our Jungle Safari adventure was such a great time! We had over 60 children join our jungle guides as we explored the nature of God and his attributes. We learned that God is Creator, Provider, Protector, Savior, and King! We also had a great time learning that since God provides and protects us, that we can do the same by helping others. The Safari crew did many service projects, including bringing supplies for Upper Des Moines that over-filled three grocery carts! Our mission project for the week was Back2Back Ministries, and the goal we set was to raise $100.00. God blessed us, because not only did our Safari crew help us reach our goal, we greatly exceeded it, and by our last evening, we reached over $356.00 for our project! WOW! We had a great time praying, praising, singing and shouting to God! And there was no doubt that God was smiling as we sang his praises! Thanks to all the organizers, teachers, and youth helpers who helped guide us on our Jungle Safari! And parents, thanks for letting your kids join our adventure. God is good, all the time!! 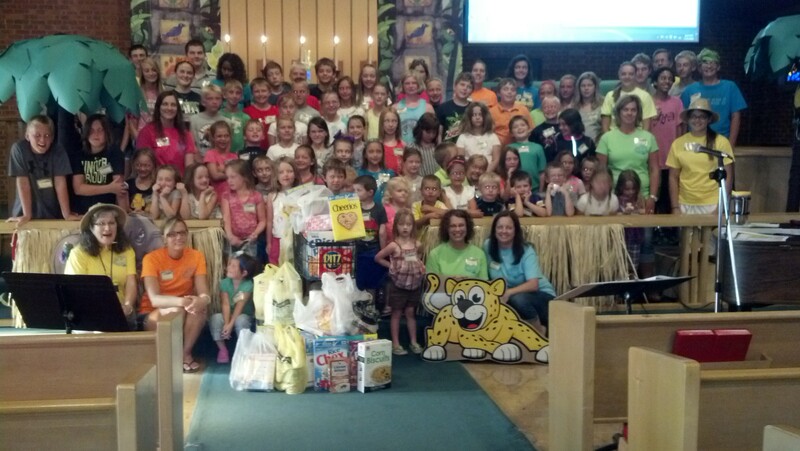 PS: Watch the photo tab for more VBS pictures – – coming soon!